Twitter reports its second profitable quarter on Wednesday. Twitter Inc. (TWTR - Get Report) reported its second-ever profitable quarter early Wednesday, April 25, proving it can further ride out last year's positive momentum. Here are the most important numbers to keep in mind from Twitter's first-quarter financials. Net income in the first quarter came in at $61 million, or 8 cents a share. The company also was profitable in the previous quarter, the fourth quarter of 2017. The last two quarters marked Twitter's only two profitable quarters in its 12 years of existence. Earnings in the first quarter topped analysts' forecasts. Earnings in the first quarter of this year were starkly different from the first quarter of last year, when Twitter reported a net loss of $62 million, resulting in a loss of 9 cents a share. Twitter offered second-quarter guidance for earnings before interest, taxes, depreciation and amortization of between $245 million and $265 million. If Twitter's projection is correct, second-quarter earnings would easily top analysts' current consensus guidance of $217.8 million for the three months ending June 30. The social media site, which has remained front of mind for many Americans as President Donald Trump's communication medium of choice, reported that it expects to grow its user base by 10% to 15% in 2018. Twitter said it increased monthly active users 3% last quarter from a year earlier to 336 million, topping analysts' expectations of 334.3 million users. The bulk of monthly active users came from abroad, as 267 million were international compared to just 69 million in the U.S.
Daily active users for the first quarter grew 10% from a year earlier. This quarter was the sixth consecutive quarter Twitter reported double-digit daily active user growth. Sales surged 21% in the first quarter to $664.9 million, the most in a three-month period in two years. The increase easily topped Wall Street's forecast of $607.7 million for the quarter. Ad revenue totaled $575 million, an increase of 21% year over year. Analysts expected $526.1 million in ad revenue for the quarter. Data licensing revenue added another $90 million to Twitter's top line and increased 20% from last year. Total ad engagements increased 69% year over year. "Video now accounts for more than half of our ad revenue, and was our fastest growing ad format in Q1, with strength across in-stream pre-roll and mid-roll ads, FirstView, Video Website Cards, and Video App Cards," Twitter said in a statement. While U.S. revenue eked out a 2% gain from last year to $347 million, international revenue surged 53% to $318 million. "Revenue growth in [the Assia Pacific] region is being primarily driven by growth in video in Japan and performance ad products in our China export market. We expect these trends to continue, such that international ad revenue is expected to exceed U.S. ad revenue in future quarters," Twitter said. 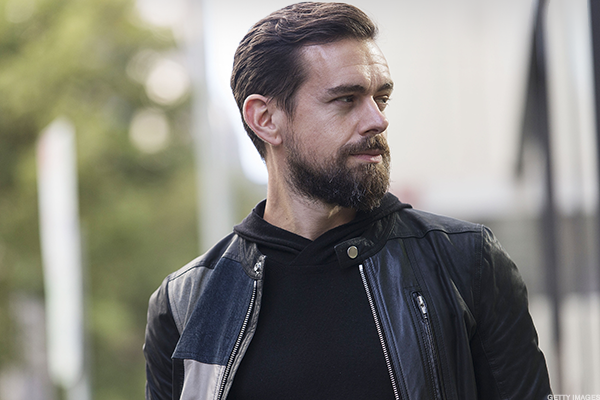 Twitter CEO Jack Dorsey said in an earnings release, "The first quarter was a strong start to the year. We grew our audience and engagement, marking another quarter of double digit year-over-year [daily active user] growth, and continued our work to make it easier to follow topics, interests, and events on Twitter." "We also introduced a new framework to think more cohesively about the issues affecting our service, including information quality and safety," Dorsey said. "This holistic approach will help us more effectively address these challenges by viewing them through the broader lens of the health of the public conversation, and we're encouraged by our initial progress in this area." After rising in premarket trading, Twitter stock tumbled 5% to $28.92 in morning trading. Shares have risen 82% in the last year.